I work with a group of medical professionals here at Rehab.Help.org and based on conversations we have had with communities across the US, the vast majority of people who need treatment for alcohol abuse do not seek it. Part of the reason that many people choose not to get help may be the blurred lines between socially acceptable drinking and alcoholism. So, we created a guide that provides comprehensive information on topics like, alcohol assessments, the rehab process, and the different types of treatments that are available. Rehab.Help.org is a community organization dedicated to empowering people suffering from substance abuse addiction with tools and resources to start their personal journey toward recovery. We create and publishes comprehensive, unbiased, free web-based resources that have been featured and is referenced by many governmental agencies and organizations across the web. The CARE Clinic is a Washington University Clinic located in the Central West End that provides integrated behavioral health care for postpartum women with Opioid Use Disorder (OUD). Our services include medically assisted therapy with buprenorphine, psychiatry for co-occurring conditions, therapy, and social work/case management. We have received a United Way grant that allows us to provide this care for free to Missouri women without insurance coverage for mental health services. Priority neighborhoods are Downtown, Benton Park, Benton Park West, Carondelet, Fairground, Hyde Park, Kingsway East, Kingsway West, Lafayette Square, Marine Villa, O’Fallon, Old North St. Louis, Penrose, St. Louis Place, and Ville, Greater Ville and Tandy. 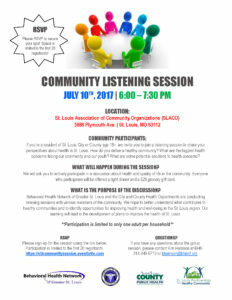 All neighborhood organization and associations are welcome to participate. Please follow directions on the flyer! March 19th at 6:00pm at SLACO Offices! We need and want your participation. Priority neighborhoods are Downtown, Benton Park, Benton Park West, Carondelet, Fairground, Hyde Park, Kingsway East, Kingsway West, Lafayette Square, Marine Villa, O’Fallon, Old North St. Louis, Penrose, St. Louis Place, and Tandy. 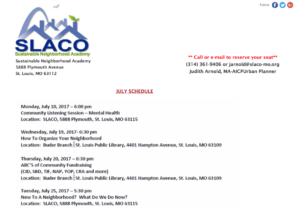 All neighborhoods are welcome to participate. Feb. 28th 6:30pm here at SLACO Offices! We need and want your participation. 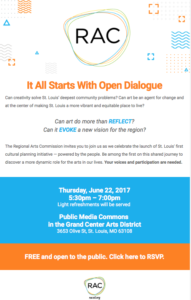 Improving the quality of life in St. Louis neighborhoods through community-based initiatives, citizen empowerment and neighborhood organizing. Please join us on Tuesday, November 14, 2017 for a Community Visioning Session at The Link Auditorium, 4504 Westminster Place at 6:30 pm (doors open at 5:30). This session, facilitated by the Kansas State University Technical Assistance to Brownfields Program, will seek community input into the future use of this historically significant building, formerly known as The Learning Center and the original home of the Wednesday Club. The Visioning goal is to meet community needs and desires. This architecturally stunning building was designed by Theodore Link, commissioned by the Wednesday Club in 1908. It is Arts and Crafts style, Link’s first foray into modernism. It holds a 500 seat auditorium with good acoustics and large, inviting rooms on the second floor. It is ideal for events and group meetings. Compare the difference between the Link-designed Second Presbyterian Church across the street. The Church features geometric stone while The Link Auditorium displays a prairie style. The Wednesday Club of St. Louis was founded in 1890 by leading women of the City who wished to continue their intellectual growth and contribute to the community. Tennessee Williams’ first public performances took place here. In more recent years, the Link Auditorium was acquired by The Learning Center where it became a vibrant teachers’ exchange and resource center, continuing the mission started over 120 years ago. The mission of The Link Auditorium is to promote an appreciation for various forms of human expression, critical thinking, alternative viewpoints, and a deeper respect for intellectual pursuits. We wish to inspire curiosity, broaden mental horizons, and engage in thoughtful discourse with respect for all. To that end, we encourage our community to discuss with us your ideas, your concerns and topics of interest. You can read more on our Website, thelinkauditorium.org. October 7: 9:30 a.m.-12:30 p.m.
Join us to learn about establishing or increasing your credit score, creating a budget, how to read a credit report and how to correct errors that may negatively affect your credit rating. Operation HOPE is a 501(c)3 non-profit organization. HOPE Inside is a program delivery model of Operation HOPE. © 2016 Operation HOPE, Inc. All rights reserved. 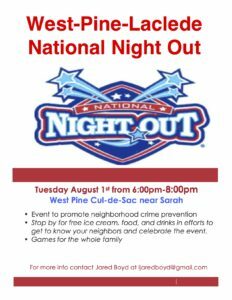 Please join us – this will be a great opportunity to get to know your neighbors with ,games for the whole family, information on neighborhood crime prevention and ICE CREAM, FOOD and DRINKS! Volunteers needed for set up and serving – a great way to meet even more neighbors. If you want to help, contact Jared Boyd at ljaredboyd@gmail.com.